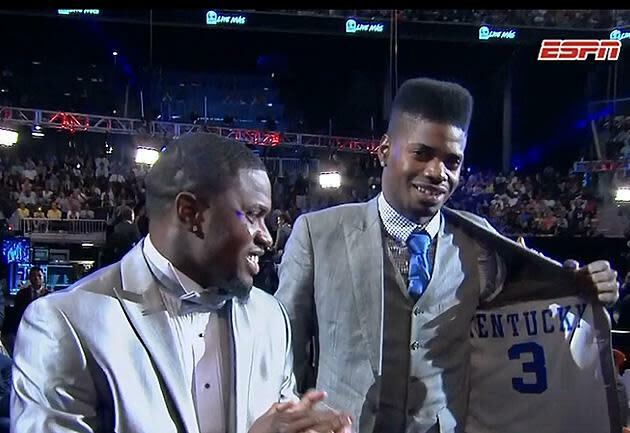 NEW YORK — Nerlens Noel might not have really known where he was going on Thursday night, but he knew where he came from, and made sure to show it off to a national audience. Not sure fans could've voted for that particular suit option. Noel was a defensive force in his brief time at Kentucky, blocking a staggering 13.2 percent of opponents' shots and coming away with a steal on 3.9 percent of opponents' possessions while he was on the floor during the 24 games he played in the 2012-13 season. While the torn anterior cruciate ligament in Noel's left knee — an injury that will reportedly keep him off basketball courts until at least December — and his limited offensive repertoire apparently fueled his drop from the top of the draft down to the mid-lottery, he's still the 12th Kentucky player or recruit (including Enes Kanter, who was ruled ineligible and didn't wind up suiting up for Big Blue) to go in the first round since John Calipari took the reins in Lexington. This fact will probably not hurt his future recruiting efforts. Nor, we suspect, will the extra in-suit promo.